Play based learning for the wider audience. Speaking at Telstra's TEDx, play based learning found a home in the world's training and development areas. If you asked that question in your classroom, unequivocally most hands, if not all, would go up. As we all know, there is an innate sense in all of us, particularly children, that derive a great sense of fulfillment and pleasure from play. Yet play, when convenient, is merely tacked-on to our lessons. For the most part, play is often overlooked and forgotten; or worse, seriousness and control is employed to move through lessons. However, by simply incorporating a few game elements, it’s easy to turn any lesson and subject into an engrossing, engaging and enjoyable learning experience. The top gaming elements of challenge, feedback, narrative and relationship, can easily be employed into any lesson. These elements also happen to be amongst the most powerful teaching methods, as researched by the evidence-guru, John Hattie. I would like to share this paradigm of game design principles to make your curriculum more playful and game-like. Other than being a lot of fun, there are biological, social and psychological necessities for play as it helps us learn and grow aware of ourselves in our environments. Children who play learn to risk-take, negotiate and overcome obstacles, as failure in play is not catastrophic and an essential aspect of learning. There are also compelling pedagogical reasons to employ play such as plays’ ability to improve divergent thinking, problem solving and social skills. Many educators and entrepreneurs now recognise playfulness and task-oriented productivity go hand-in-hand. Just look at many of the top ICT companies like Apple, Google and Microsoft. It’s not just the tech companies; apparently, the old establishment is also using gamification to build employee engagement in their tasks, such as the Commonwealth Bank of Australia. Borrow heavily from other games to start designing your own games. While I was inspired by John Hunter’s game, I didn’t know how it was played. So instead, I used a variety of games I was familiar with to design a game I thought would have the same objectives. I built the battle game-layer based on the famous board game Risk and used the technology trees from Civilisation to support research and trade. I also invited the students to help me design aspects of the game, such as the rules of engagement and negotiation rounds. The fun and learning achievements my students with our version of the World Peace Game inspired me to build many other games teaching a range of content areas, from history to persuasive writing. Leading to my development of play based learning. What better way to learn than through play. When you mention gameplay in an educational context, most educators imagine employing the use of digital games or video games in the classroom. While these can augment specific learning experiences they are often not best suited for our particular students and curriculum. Hence, there is a genuine need for creating our own games using elements that achieve the psychological, social and pedagogical benefits of play. Play strongly aligns with effective learning methods such as challenge, feedback, narrative and relationships. Look at many of the games we know and play. Can you see the elements within them? What if you could adapt the games you love to help kids learn? What if you could make a game that would help make parts of the curriculum meaningful and playful? Let’s breakdown John Hunter’s World Peace Game in terms of the play elements to see how a game can be adapted and built to inspire our learners. While games are intrinsically motivating, it helps to have challenges, clear goals or driving questions. This aligns with many of the tenets of project based learning or challenge based learning. The goal or goals could come right out of your respective curriculum into student-friendly terms. Or, in the spirit of Sugatra Mitra’s Self-Organised Learning Environments, you could pose a zany, challenging question that would generate interest and more questions on the topic. In any case, the challenge sets the tone of the game and helps build further challenges and investigations. With the World Peace Game, we used a variety of goals (outcomes) ranging from economic (number), political (persuasive) and environmental (sustainability). For a sample of the goals I used in our World Peace Game click here, bear in mind my students were in Year 3 at the time of the game. Feedback is the strongest element to both play and learning. This is achieved in building feedback loop systems into your play. Many games naturally have feedback loop systems, e.g. sports uses scores, players and fans, boardgames uses pieces, points and tokens and video games typically uses levelling up and more points. In the World Peace Game, the game board contains a range of tokens from natural minerals, landmarks, influential people and military defences. The ‘wheeling and dealing’ stage of the game also gives further feedback from the teammates and other players. Finally, unique to games in the classroom, the teacher provides opportunities for reflection and mentorship to the players. This can occur throughout the challenges, such as the Green-Screen’ challenge where students were given the task of creating a green screen movie‘ using iMovie on the iPads and Macbook. Students received feedback on both content of learning and skills of videography. There are many other opportunities for feedback throughout the gameplay and through the blogs. The interest the students have in the game can be leveraged to maximise the learning opportunities. Buy-in occurs when a player places him or herself in the narrative of the game. This has become such an important aspect of gaming that many high-end games use storywriters to build authentic characters and (un)believable plots around the player. Similarly, you build the game around your learners. This could be as complicated as writing a story and creating characters for the game, or as simple as giving a learner a role, title or position. This could also be further supported by cross-references to other narratives. For example, before each round of the World Peace Game you can read excerpts from Sun Tzu’s Art of War or Machiavelli’s The Prince, and facilitate discussions on a variety of topics such as war, peace, leadership and change. Using the technologies of the iMovie app on the iPad and Macbook, students used a green screen to co-write the narrative for our World Peace Game. You can see in the two clips how the students’ work developed. Finally, the use of a game blog and wiki also supported the narrative, conversely giving students themselves the power to build the narrative, store up research and information, and also it provides a place to reflect on their learning. This is another element that is naturally nurtured through the game. The very act of playing a game and working through the challenges instills trust. Even in competitive games, there is a mutual understanding between teams and players to follow rules, take turns and challenge each other. The World Peace Game placed the learners in teams with challenges that needed the whole team to collaborate but sometimes forced them to compete against each other. Nonetheless, relationship was built upon the trials and tribulations of the challenges and by playing in the narrative. For our “Peace Game”, we used a range of mobile devices, iPods to iPads, supported by Macbooks. 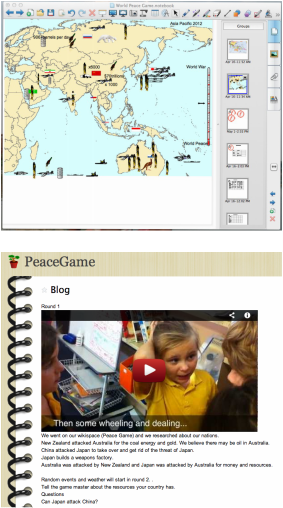 The iPods and iPads were used in a variety of ways, both as tools for research and content creation, such as writing content onto their World Peace Game wiki and recording broadcasts from their nations using the iMovie app. We employed the use of iMovie on Macbooks to support our green screen editing. We also utilised our interactive whiteboards for our game board, using Smart Notebook to design our own “Risk” like environment.